Norm Harry hosts the Klahoose Language show on Cortes Radio, CKTZ 89.5 FM, at 2:30 on Wednesdays. How the Northern Coast Salish Nations (ʔayʔaǰuθəm) almost lost their language and the push to bring it back. The four rocks – in Campbell River, Lund, Squirrel Cove and Toba Inlet – on the traditional boundaries of the Klahoose territory. How these place names show where the ɬəʔamɛn went to pick berries or camp etc within their traditional territory. 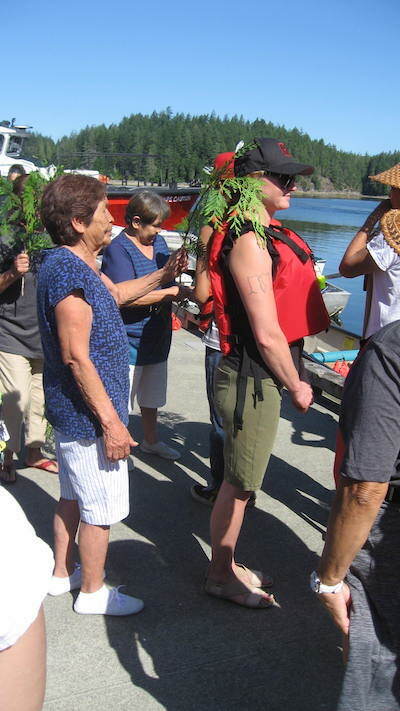 “Thank-you from coming to the Klahoose territory* .… We say it with a good heart so that people feel welcome, not like an outcast. Especially when I am on the radio show. This is all our island. We have to share it as a home, even though it is the territory of the Klahoose people. You don’t get pushy about it, you do it in a polite manner so that everybody is equal.